Steel rolls are capitalized in many key forming operations in production lines. Steel rolls are capitalized in many key forming operations in production lines. Whether folding steel for the packaging industry or flattening operations well machined steel rolls can be powerfully utilized. 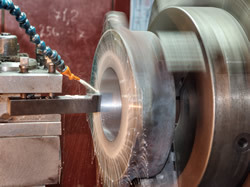 In some instances, where profiles are very precise, we will grind our steel rolls to achieve optimum precision. Then, both before and after necessary coatings (PVD/CVD) we polish our rolls to maximize tooling life. Connect with us today to start a quote.